The rapid diminution of Australia’s aid program, now around one-third smaller than it was budgeted to be in 2013-14, has effectively muted discussion about deficiencies in aid allocation. The natural tendency among those opposed to large aid cuts has been to call for a restoration of aid growth while largely deferring consideration of allocation questions. We have frequently written, both jointly and individually, about the under-allocation of aid to certain purposes. Now, as the announcement of the 2017-18 federal budget approaches, we have collaborated on a more comprehensive policy brief about aid allocation priorities for 2017-18 and beyond. In it, we outline two aid budget scenarios, analyse recent trends in the allocation of aid to purposes, and highlight areas in which there are emerging or longstanding gaps in Australia’s aid effort. Figure 1 illustrates our two aid budget scenarios for 2017-18 and the three years to follow (the ‘forward estimates’ years). In the first scenario, Official Development Assistance (ODA) is held constant in real terms. 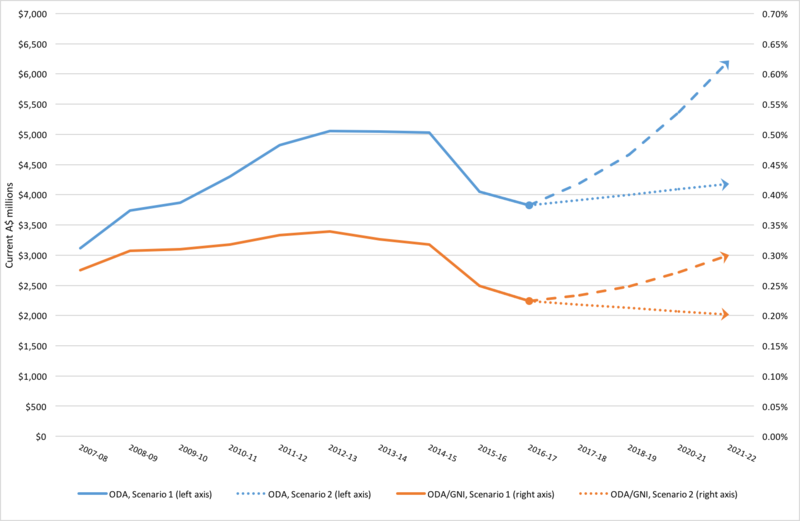 In the second, which is a slightly relaxed variant of a recommendation one of us has made elsewhere, ODA grows toward 0.3% of Gross National Income (GNI) by the final year of the forward estimates period, 2021‑22. In the first, steady-state scenario, the aid budget would be $3.9 billion in 2017-18, rising to $4.2 billion in 2021-22. Australia’s ODA/GNI ratio would fall, courtesy of economic growth, to 0.2% over the same period. In the second, growth-to-0.3% scenario, the aid budget would be $4.2 billion in 2017-18, rising to $6.2 billion in 2021-22. Roughly speaking, the growth-to-0.3% scenario would require increases in each of the next four budgets of $350 million, $500 million, $700 million and $850 million, respectively—an average annual increase of $600 million. We are fairly sure, as there has been no indication to the contrary, that the government’s 2017‑18 aid budget will resemble the steady-state scenario. Nevertheless, we believe that Australia’s aid effort—measured in ODA/GNI terms—should be restored over several years in order to at least equal the average effort of the OECD donor collective, which until recently had been quite stable for a number of years at 0.3% before rising, in 2016, to 0.32%. We have therefore distinguished between allocation measures requiring only feasible shifts within roughly the existing aid envelope, and those depending on a significant expansion of the envelope in line with something like our second budget scenario. 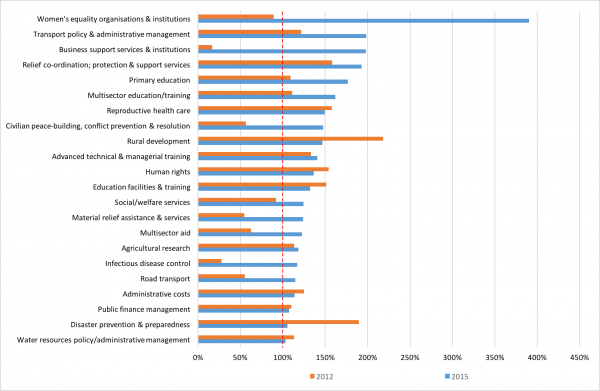 Enough time has now passed since the change of government in late 2013, and the consequent implementation of large aid cuts, that one can begin to perceive shifts in the overall sectoral composition of Australia’s aid program. On undertaking a fine-grained examination of shifts in the allocation of aid over time, it is possible to see a clear and understandable move toward the priorities articulated by the government in its 2014 aid policy framework. Given that overall aid volume has been greatly reduced—by around one-quarter in real terms from 2013-14 to 2016-17—and that many specific priorities account for a relatively small share of the aid program, the best way to highlight changes is to look at how a sector’s program share in a given year, that is, its share in total aid, compares with a long-term average. This we do in Figures 2 and 3. We consider all sectors accounting for a non-trivial share of the aid program over the ten years to 2015 and order them according to their variance in 2015 from the 10-year average (2006-15) program share. For example, aid for women’s equality organisations and institutions accounted for 0.6% of all Australian aid from 2006 to 2015 but accounted for 2.3% of aid in 2015, so the 2015 variance from the long-term average program share is 2.3/0.6 = 383%. We show also, for comparison, the variances in 2012 relative to the same average program share. Overall, a clear enough picture emerges. In proportional terms, Australia is doing less than it was in governance, health, agricultural development and environmental protection. The balance has shifted in favour of scholarships, basic social and economic infrastructure, emergency response, and several more specific priorities of the government including trade facilitation and women’s empowerment. In addition, voluntary contributions to multilateral organisations have been squeezed; core contributions not so much. In light of the allocation trends outlined above, we highlight five areas in which there are emerging or longstanding gaps in the Australian aid program, which could be addressed at no great cost within a fairly static overall aid budget envelope consistent with our steady-state budget scenario. Outward investment promotion, through the establishment of a bilateral development financing institution. Demining and related objectives, through an approximate trebling of the small amount of funding that is currently allocated to relevant activities and the adoption of a new mine action strategy. Public policies and institutions, through the re-establishment of a mechanism to support Australian public sector assistance to public institutions in the developing countries of our region. Regional labour mobility, through the establishment of a public sector office geared toward addressing the main factors that currently limit employer demand for seasonal workers from neighbouring countries. We estimate that the total funding requirement associated with the five priorities above might be somewhere in the vicinity of $100 million per annum. It might be thought this requirement could mostly be accommodated within the $85 million nominal aid increase assumed under our first aid budget scenario. However, DFAT was forced to suppress funding to multilateral organisations, without reducing overall commitments, in order to deliver the savings required by the government in the 2016-17 budget. Any associated shortfalls will have to be made up from 2017-18. These will be financed in the first instance from nominal aid growth. Nevertheless, the additional funding required is not at all substantial in the context of an aid budget of approximately $4 billion. We suggest that it could be realised in two principal ways. First, the share of the aid program allocated to tertiary scholarships at Australian institutions could be reduced somewhat. Even if not reduced to the level that prevailed around 2010, which was 5-6%, a cut of about one percentage point to about 7.5% could yield savings of some $50 million per annum. Any such cut would preferably target short-term awards which, despite offering dubious development benefits, have come to dominate over long-term awards. Second, the government could lock up rather less money in country programs by shifting toward a thematically-based approach to aid allocation for all but the most aid-dependent countries. Enacted aggressively enough, this shift could free up more, perhaps much more, than $100 million per annum. Even enacted conservatively, it should be able to free up at least half of that amount. We indicate a further five areas in which Australia could and should do much more under a scenario of significant aid growth, possibly combined with aggressive implementation of the two savings strategies just outlined. We take it for granted that assistance for health and education, and related sub-sectors like disability, would rise under any such scenario. Our emphasis here is on important areas at risk of remaining underfunded. Food and water security, through the allocation of an additional $180 million or so per annum and an expansion of the remit of the Australian Centre for International Agricultural Research to take in water security, as well as biosecurity and nutrition. The health, welfare and rights of women and girls, through the allocation of an additional $100 million or so per annum and the establishment of a dedicated funding envelope for action across the region on policy and legislation, violence against women, and sexual and reproductive health. Humanitarian aid, through a large increase in support for the UN Central Emergency Response Fund, a restoration of funding for disaster preparedness and protracted crises, and the pursuit of a larger and more distinctive role in crisis situations through the use of earmarked resources. Climate change and the environment, through the provision of not less than 5% of the aid budget for action on climate change mitigation and adaptation. Multilateral development financing, through an increase in real dollar terms of around 25% in Australia’s contributions to the multilateral system. Admittedly, making all the moves suggested here would be difficult. But we believe each individual move deserves at least serious consideration, and that some might very easily be made even if the 2017-18 budget envelope turns out to be in line with our more constrained budget scenario. Bob McMullan is a Visiting Fellow at the Development Policy Centre and was Parliamentary Secretary for International Development Assistance from 2007 to 2010. Robin Davies is the Associate Director of the Development Policy Centre. Robin Davies recommended, in his contribution to the Development Policy Centre’s February 2017 submission to the government’s foreign policy White Paper process, that aid be increased to 0.3% of GNI by 2020. This requires an analysis of data from the OECD’s Creditor Reporting System (CRS), which collects data at the level of individual aid activities. The number of detailed CRS sector categories excluded by the application of the non-triviality criterion is 126. 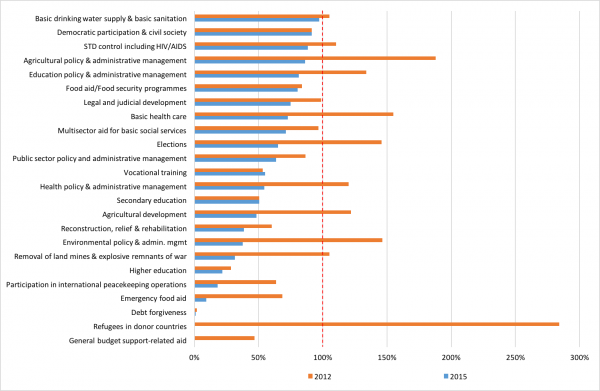 Only 10% of Australia’s aid fell into the excluded sectors over the ten years to 2015. Scholarships fall under ‘multisector aid’ in Figure 2. In the context of the 2016 federal election, the government announced its intention to establish a $100 million ‘regional health security partnership fund’ which would ‘harness Australia’s world leading research institutions, scientific expertise, innovators and entrepreneurs to improve health outcomes in our part of the world’. This has not yet seen the light of day. Presumably it will move forward in 2017-18 but it is unclear to what extent it will fund research as distinct from surveillance, containment, the provision of existing drugs and diagnostics and the general strengthening of health systems. As proposed by Robin Davies in his contribution to the Development Policy Centre’s submission to the government’s foreign policy white paper process (linked at note 1). We do not here discuss options likely to be viewed as inconsistent with the wider policy framework of the current government. For example, we do not include the option of expanding support for activities relating to the rights and conditions of workers in the Asia-Pacific, though we do believe more should be done in that area. It is a political reality that no such expansion is likely at present. these choices the esteemed authors could clearly explain why they chose both lots of five areas over other sectors. Why for example should the government not focus on elections, human rights and other governance related programming or other areas that the graphs above show are no longer as much of a focus- disaster prevention/ health policy/rural devt? Perhaps though the ten areas highlighted above are chosen based on some sort of assumed underlying logic around added value/effectiveness/ need for these sectors?